I must admit that it’s been one of those weeks where I’ve woken up not knowing what day it is. Life has gotten busy with my kids back in school and me trying to invest as much of my brain energy into meeting deadlines before the year ends. Add to this the other dozen things I need to squeeze in throughout the day (aka. cooking and laundry), and it’s no wonder my days all end up feeling the same. But today, my friends, is Friday! The end of a work/school week and the start of the weekend. I thought I’d do something different, and hopefully fun, for my post today. (I happened to stumble upon this idea when I was searching for “author blog post ideas”.) I’ll be describing myself, my favorite character of mine, and my favorite one of my books, each in 5 words. And since it wouldn’t truly be a Friday Five post without five topics, here are 2 bonus ones. 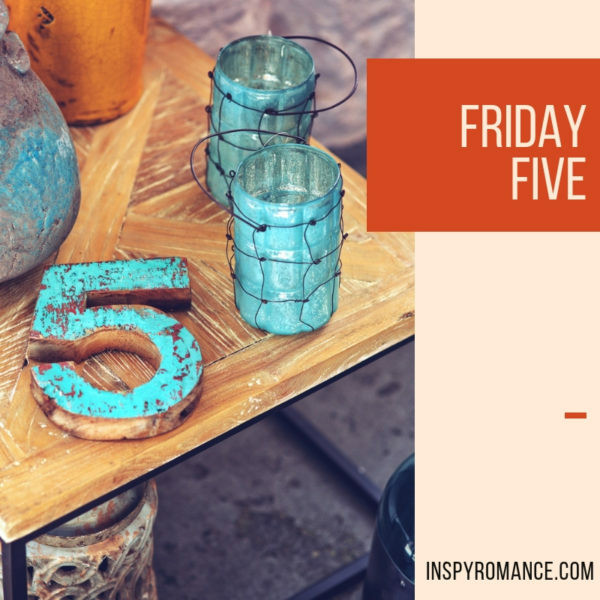 What’s your Friday Five? If you could pick one of the topics above, how would you describe it in 5 words? And just an FYI, the two books I mentioned above, along with Taking a Chance on the Heartbreaker, are part of my Taking Chances on Love series. I recently revamped these books by giving them a thorough edit, new titles, and new covers. Giveaway: I’d like to give away a $5 Amazon gift card (since we’re all about the number 5 today). One winner will be randomly chosen from the comments below. The giveaway will remain open until midnight on Wednesday, September 26th. Hi Kathy! What beautiful words you chose. Thanks for reading and commenting! This is a great way to start a Friday, Liwen, thank you! I have just barely opened my eyes, lol, but I will choose five words that fit my life: blessed, full, loving, happy and difficult…. Hi Paula! Good morning. :) Thanks for reading and commenting with your barely opened eyes! What a fun post! I will add to the 5 list with a fall one! Fall: beautiful, crisp, delicious, endings, cozy! Happy Friday! Hi Katie! Oh yes, those are perfect words for fall. Thanks for reading and commenting! Hi Liwen! What a clever interactive Friday blog idea. Definitely understand the feeling of loosing track of time in the business of life. Been a hectic 2 weeks at our house with additional Oma Care responsibilities due to the beginning of school and our oldest son being out the country for 10 days. Now I hope to catch up on my reading. Friday Five: Life – delightful, inspiring, intense, unpredictable, and funny. Had a chuckle that you used “funny.” 20 month old granddaughter’s newest phrase is “That’s funny.” Then she giggles. So you had me chuckling on this rainy Michigan morning. Best wishes and enjoy your weekend. High Five! Hi Renate! So glad you had a good chuckle from this. Your granddaughter reminds me of my almost 2 year old niece. These little ones say the cutest things. Happy weekend and hope you get some reading done! Thanks for reading and commenting! Hi Wemble! Sounds like a great 2 weeks off you have to look forward to. Enjoy! Thanks for reading and commenting! Our Friday 5: grocery shopping, reading, running, reading with daughter and a drink! Hi Irma! Love how you fit reading in 2x in one day. :) Thanks for reading and commenting! Hi Kelley! Ooh, colorful—that’s a good one. :) Thanks for reading and commenting! Hi Tracey! Wow, bonus points for using all U’s. :) Thanks for reading and commenting! God’s morning sunrise. Inspiring, breathtaking, light filled, ever changing colors, floating clouds. God’s mercies are new every morning! Hi Diana! You painted such a beautiful picture. :) Thanks for reading and commenting! Hi Jackie! Love the words you chose. :) Thanks for reading and commenting! Great post! My 5 things would be Thankful for: Life, Salvation, my husband, my kids and grandkids, my friends. Hi Paula! Today happens to be World Gratitude Day, so you picked a great topic. :) Thanks for reading and commenting! What a fun post. Thanks. Hi Priscila! Aww, thanks for choosing that one! This is the perfect time of year for spices. :) Thanks for reading and commenting! I should also tell you that I’ve never been one to like spices in my coffee, but decided to try cinnamon after re-reading it earlier this year. Wow, no way! :) So glad you tried it and liked it. God: love, mercy, best friend (I know 2 words), Creator, Forgiving and my Savior. Too many words but I love to write as a hobby and don’t have it in me to write only 5 words. Hi Pat! Yes, words are so fun and meaningful, it’s hard to limit them. :) Thanks for reading and commenting! Hi Natalya! Haha, I tell my kids I know everything, but not really. ;) Love how you got 5 Gs in there. Thanks for reading and commenting! Hi Shannon! Yay for another fellow introvert. :) Thanks for reading and commenting! Hi Margaret! Aww, thank you so much. :) Your words make my day (and encourage me to keep writing). Thanks for reading and commenting! Hi Catherine! What wonderful words. :) Thanks for reading and commenting! At the moment, life is confusing, unpredictable, sad and hard, but hopeful. Hi Linda! Big hugs to you. I’m glad you still have hope. May God give you His peace and grace during this difficult time. Thanks for reading and commenting. I can’t pick a favorite book of yours (I’ve enjoyed every one I’ve read), but I’ll pick the last one I read which was A Sudden Spark: romantic, heart-warming, tender, sweet, sigh. Hi MJSH! Aww, those are perfect descriptions of Brandon and Bria’s story. :) Thanks for reading and commenting! Hi Lori! Love your five words. :) Thanks for reading and commenting! How fun! Here are 5 ways I would describe myself: introvert, sarcastic, reserved, planner, animal lover. Hi Jessica! I find that many introverts have a good sense of humor. I bet yours is fun since you included sarcastic. :) Thanks for reading and commenting! Hi Teri! Those are some awesome blessings you listed! Thanks for reading and commenting! Hi Janet! You’ve covered a lot of great genres. :) Thanks for reading and commenting! Hi Michelle! That sounds like a wonderful book. Thanks for reading and commenting! Hi Sabrina! Aw, I love that you included bumpy and choices and of course, love. :) Thanks for reading and commenting! Hi Priscila! Aww, so beautiful! Thanks for reading and commenting! I am really enjoying the Spark series. Hi Gina! What great choices of words. :) And I’m so glad you’re enjoying the Spark brothers. I can’t wait to write the next book in the series. Thanks for reading and commenting! I loved reading your five! The books sound great. Hi Glenda! Thanks so much for reading and commenting!